Recently my family went out to dinner. It was a “no one wants to cook” kind of night, and we ended up at Wood and Tap, a chain-type place with a decent burger, a respectable beer menu, and no wait time. If you ask my kids about Wood and Tap, they’ll tell you the best thing about the establishment is that kids menus come with Wikki Stix, which are wax coated strips of yarn that can be manipulated into shapes, numbers, letters, or whatever a kid can imagine. The Wikki Stix kept the kids busy until the food came, and we had a rousing game of tabletop horseshoes crafted by my 10-year-old son. While the kids were bending their creations, I was watching their hands. My daughter has the hands of an eight-year-old, smooth, but not as chubby as they used to be. Her hands have looked the same for the past couple of years. Her brother’s hands surprised me, though. His hands look older. The lines are sharper and the angles more defined. I could see the small muscles working under the skin to make a miniature bow and arrow, and I was fascinated. When did his hands get older? Hands have always been a time marker for me. I remember noticing the aging of my own hands in elementary school, and the more shocking aging of my hands about 20 years later. I recall as a child, running my fingertips along the lines and veins of my grandmother’s hand, wondering how skin with so many lines could feel so soft. I’ve always kept a close eye on my mother’s hands, admiring her long fingers and her nicely shaped nails. As a child, I took pride in knowing her hands comforted patients and saved lives in her career as a registered nurse. I copied the way she folded her hands in prayer, and I loved the smell of the Vaseline lotion she used to keep in the bathroom and the car and her purse to keep those heavily scrubbed surgical hands soft. As an adult, I watched the texture and coloring of the skin on her hands change, becoming grandma hands several years after actually becoming a grandmother. 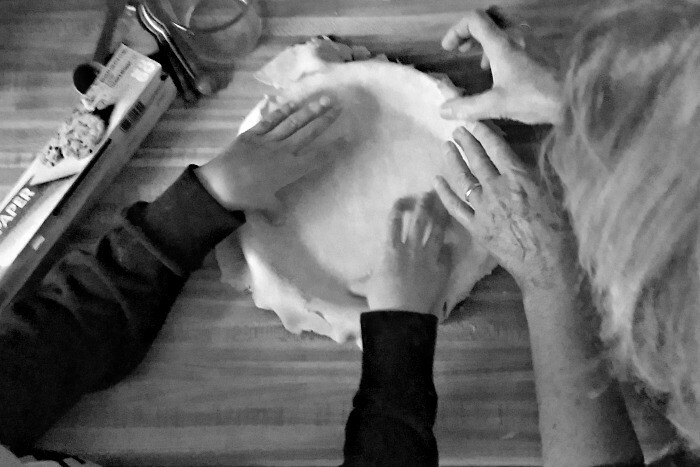 This past Thanksgiving, I watched the same hands that held my own as a child form pie crust with my son, and the moment moved me to tears. The image tells a story of love, and family, and tradition, and most importantly, of time together. As I type this, I am watching my own hands. I am 40, and my hands reflect this milestone age. They are lined, and the skin feels more papery than it has in the past. I look at my hands with wonder, not regret. These hands have jumped rope and swung from monkey bars; they’ve crept closer to a crush’s hand in a darkened theater, and have gripped a starting block, ready to dive in the water. My fingers have become callused from writing, and have given the one fingered salute in both anger and in recognition of a cleverly delivered insult. My left hand wears the symbol of my lifelong commitment to my husband and the promises he made to me in return. These hands have held babies and the hand of my dying father. My hands have made hugs tighter, and have cut my kids’ meals into bite-sized chunks. There has been an incredible amount of life lived in my hands, and when I watch my boy sculpt a monocle for himself at a restaurant with his ever-changing hands, I’m surprised at how he and his sister are growing in so many ways and I’m am excited for the amount of life their hands will see. Damn you Amy Flory. This and the post about lines on your face. Haha. Who knew old skin would be such a touchstone? Thank you! And thank you for sharing it. Love you! Thank you, Kara! You’ve been blessed with many hands to hold, and those hands are so lucky to have you taking care of them! Beautiful reflection!! ….. and the timing is ironic because I was just examining my teenage daughter’s hands yesterday and marveling at how they are changing. I love this Amy, way to make me cry! lol. 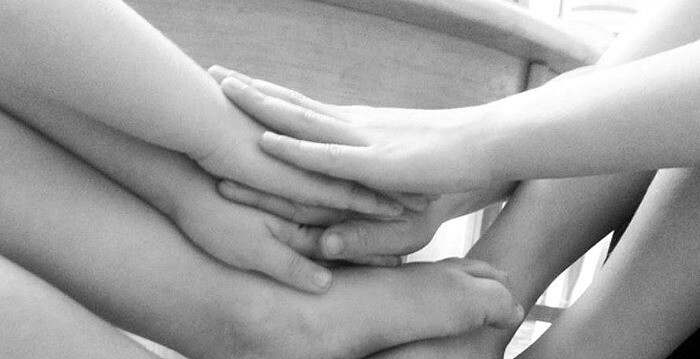 This is beautiful and truly made me think about life, my own hands, my kiddos. It hits me a little harder as my oldest is almost 16 and it kills me every day how grown up he is 🙁 But it is life and there is no stopping it, so I am going to do my best to enjoy everyday. Amy, you are such a sweetheart! This observation on hands is so special and beautifully written. My hands look so much like my mothers hands now. I hope I can do good things with them as my mother as always done. Thank you for sharing your gift and insights. I am so glad you are my daughter’s friend.